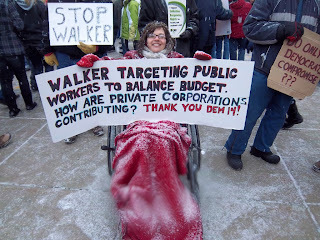 While Wisconsin Gov. Scott Walker’s (R) law dismantling collective bargaining rights has harmed teachers, nurses, and other civil servants, it’s helping a different group in Wisconsinites — inmates. Prisoners are now taking up jobs that used to be held by unionized workers in some parts of the state. As the Madison Capital Times reports, “Besides losing their right to negotiate over the percentage of their paycheck that will go toward health care and retirement, unions also lost the ability to claim work as a ‘union-only’ job, opening the door for private workers and evidently even inmates to step in and take their place.” Inmates are not paid for their work, but may receive time off of their sentences. The Washington Examiner called Racine’s move “another success story” and “all great news for Wisconsin taxpayers. Hopefully, we’ll see more of it.” So far, it appears no other jurisdiction has followed Racine’s example — for now. It may just be a matter of time to allow existing union contracts to expire. The spokesperson for the Sheriff’s Office of Dane County, which includes Milwaukee, said, “Nobody in our jail will be benefiting…at this time” from the new law, but the left the door open for future changes. While giving prisoners more work and activity options is generally positive, using free inmate labor to replace public sector workers is a disturbing trend.